The murder of a child, whether it happened yesterday, or two thousand years ago, makes for riveting reading. In this case, Forensic archeologist Dr. Ruth Galloway is called in by the police to investigate a set of children's bones that has been found near the coast. This draws her into a case that DCI Harry Nelson has been pursuing for the past ten years. 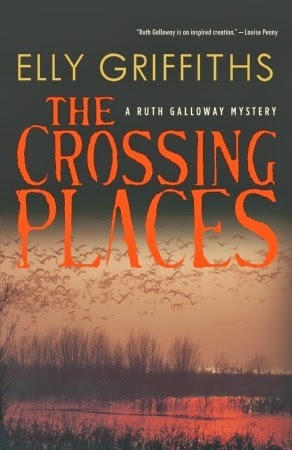 Given her connection to the area, it is not surprising that Ruth can't stop wondering and then searching for the truth. She's not a perfect woman, she's made mistakes, is admittedly a bit over weight and fears becoming one of those lonely women who collect a houseful of cats. For me, it makes her a compelling character who I want to know more about. I could hardly put this book down. I felt comfortable with Ruth and her life. I could easily sit down and have tea with her, and then a glass of wine later in the day. Likewise, Harry Nelson is an easy to like character. He knows his limitations and is willing to call in a specialist when needed and then readily accepts her expertise. The coastal setting of the story is very foreign to me as I live more than a thousand miles inland, but author Elly Griffiths made it come alive. I could imagine the fogs and the heavy mist, and practically smell the salt in the air. She created two very realistic characters in Ruth and Harry that I want to learn more about. Fortunately, their stories continue in the series, and book six, The Outcast Dead is due out March 11, 2014. Thanks to McCelland & Stewart for use of the cover image. Nice review, Heather. I read The Janus Stone by Griffiths and really enjoyed it. I have this one in my to-be-read pile. This is a fantastic series, and I am so glad to know that a new book will be published soon!